Lightact can play .MP3 and .WAV audio files. In order to be able to play them, you first have to import them. You can do that by either pressing Ctrl+D or clicking on the Import button in the Assets tab. Find the audio you want to play in the dialog window that appears. Once imported, it will appear in the Audio section in the Assets tab. In order to be able to play it, you first have to select which output device should receive the audio stream. You can do that in the Devices (F7) window. When the node appears, select the device where you’d like to send the audio to and then check Streaming checkbox. Insert an Audio File Reader node and an Audio Player Node and connect them as shown above. 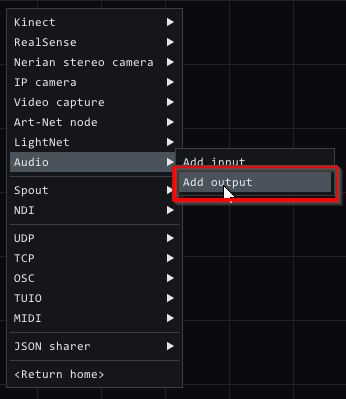 Select the Audio File Reader node and, in its properties on the right, select the audio file you want to play. This should be it. If you press play (or hit spacebar) you should hear the audio playing on the device you selected.